Over the last several weeks, contributors from a range of sectors have described a sad truth that has been revealed by the data for years. For nearly every group of students, Michigan’s public education system is simply not meeting the needs of students, and as a result, far too many Michigan students are not prepared to succeed after high school. Once an average state for educational performance, Michigan is now in the bottom 10 states for many measures. The good news is that rather than experimenting with new policies and practices, Michigan can begin by looking to the examples of leading education states. By paying attention to educational data and learning from the best-practices of leading states, we can provide all Michigan students with the high-quality education that they deserve. First, we should look to Massachusetts — one of the top performing places for education both nationally and globally. Over more than 20 years, Massachusetts has thought about educational improvement in a comprehensive and ongoing way. Greater accountability for both schools and educators’ performance, combined with major investments in educator and school capacity-building, along with additional resources for poor schools were the starting ingredients of what became system-wide educational transformation. Importantly, policy gains have been maintained across multiple governors from both political parties. Evidence-based policies are coupled with strategic investments. Accountability, along with ambitious learning goals for all students, are used as improvement tools. Most important, Massachusetts has prioritized continuity, building on progress across administrations and legislatures, regardless of party control. We should also look at Tennessee — the fastest improving state in the nation. There, the state’s long and laser-like focus on supporting teachers has paid off. The state was an early adopter of a high-quality educator evaluation system that combines data and feedback to inform instruction and guide professional development. Three quarters of Tennessee teachers say the evaluation process has improved their teaching, and nearly as many say that it also has improved student learning. The state also has invested heavily in high-quality training for new and experienced teachers, supporting educators to meet high expectations. Not only has Tennessee gone from a bottom-10 state to the top half over the last decade, but more than 80 percent of surveyed teachers in Tennessee say that they feel appreciated for the job they are doing. 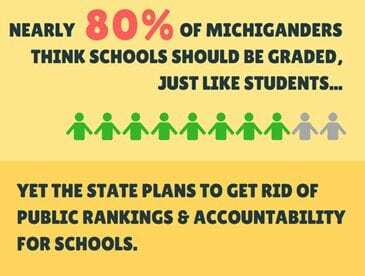 Time and time again, Michigan has gone against best practice, data-informed strategy and even common sense, and, as a result, we have slipped from an average state to the bottom 10 states in the nation for education. When scores on the state test dropped, we made the test easier to pass instead of asking hard questions. After raising academic standards, we assumed that the hard work was done, instead of robustly supporting our educators to teach to these standards. And instead of digging into troubling state assessment data, Michigan is flirting with changing the assessment and the data once again. Brian Gutman is director of public engagement at The Education Trust-Midwest. Click here the full Detroit News article.